How did this happen and why? Contemplating Newtown. Reflections. Copyright 2012. All rights reserved. Gina F. Rubel. Friday, December 14, 2012 is a day that Americans will remember for a lifetime if not for many generations to come. A day when the nation's heroes became 20 innocent children and seven elementary school educators and administrators – all of whom felt safe and secure when they arrived at school that morning. Today we ask ourselves, "How did this happen and why?" "Who is to blame?" "How do we stop this from ever happening again?" We have no real answers. Like most parents, immediately following the news that there was a massacre at Sandy Hook Elementary School in Newtown, CT, all I wanted to do was to see our children. My husband called to tell me what he had heard on the news as he was driving home. His immediate thought was to protect our nine-year-old son from hearing the news on television so that we could deliver the horrible message in the gentlest way possible. And so we did. I then called our daughter who was visiting with a friend and told her that I needed her to come home. And so she did. That night I held them both a little tighter and both a little longer. And our parents called us just to say, "I love you." The following Monday, our children had the blessing to go back to school but this time with the knowledge of the terrible tragedy that had occurred just three days prior. As I kissed our son and said "I love you" in front of the school, all I could ask of God was to keep him and all others safe. Then I drove past my daughter's middle school and asked God to keep her and everyone in the school safe as tears began to fall once again with the reality of Dec. 14th living in a nation of lost innocence. A friend of mine had this to say: "I drove by my son's school today and my heart stopped. . . . I lost my breath, then I stopped. . . . I took a moment to thank God that it was not his school, in our town, on some random Friday, for some un-godly reason." I thanked God for all the same things. But as I contemplate this horrible tragedy, it is ever apparent that it did happen in "our town" because those children have relatives who are our friends. Those heroes and their families are our neighbors. We live here in America where the national debates center around funding cuts in education, unemployment and healthcare, gun control, and rising taxes –all of which affect our personal safety physically, emotionally, mentally and financially. And we ask, "How did this happen and why?" We have no answers. As a child, I remember my mother talking about where she was when Kennedy was assassinated. She recalled how she found out about the tragedy, how the nation came to a stop, how the nation mourned, and how all eyes turned to the television to say goodbye. They asked, "How did this happen and why?" On January 28, 1986, when I was in 11th grade in Catholic school, I remember sitting in our homeroom watching the launch of the Space Shuttle Challenger when all of a sudden it went from being an epic launch to a national disaster. The 30 or so young ladies and our teacher all began to cry when we understood that we had just witnessed the loss of innocent lives. We asked, "How did this happen and why?" On September 11, 2001, I was sitting at my desk in work when my father called and told me that a plane had hit the World Trade Center. I turned on the news and witnessed the impact of the second plane, the uncertainty of the national news media as to what could be happening, the gut feeling that this was terrorism and that America had lost its innocence, and the fact that I had to leave the office (despite my boss's missive that we had work to do) to pick up our daughter. I had to go home to be with my family. As we cried, we asked, "How did this happen and why?" And as the incidents of the Columbine High School massacre unfolded in April 1999 and the stories of the Aurora, Colorado Movie Theater massacre unfolded earlier this year, we all asked ourselves, "How did this happen and why?" And still, we have no answers. In fact, we may never have real answers. We may argue, debate, and fight about the "issues." We may read missive after missive in the media and on social media. We may hear people pontificate about the right and wrong answer. But yet, we will never learn absolute truth in this lifetime. What we do have is the knowledge that each moment of life is precious and sacred. We are privileged to live in America where we have freedoms of life, liberty and the pursuit of happiness. Where we have the Constitution and its Amendments to protect us from ourselves and our government. Where we can debate issues openly without the fear of punishment. Where we can love who we wish and live how we choose. Where we can fight for equal rights for all. Where food is plentiful and education is free. We may never have the answers to "How did this happen and why?" but we must also never forget what happened in Newtown, CT. So today, let us all curb our judgment and anger towards others, listen a little bit harder even if we disagree, thank God for what we do have, pray for all those directly affected by last week's horrible tragedies, and vow to make a difference in our communities which were all truly affected* by the loss of lives and innocence on Dec. 14, 2012. *To everyone directly affected by the Sandy Hook Elementary School Massacre I send my heartfelt prayers – for the children are angels and the adults are true heroes. May you find peace someday, somehow. Godspeed. Gina F. Rubel recently authored a blog for The Legal Intelligencer titled, “Social Media and the Courts: Recap From TLI Litigation Summit, Part IV.” To provide you with a bit of background, in September 2012, The Legal hosted its first annual Litigation Summit in Philadelphia and Gina co-moderated its lunch program with Mary Platt of Griesing Law. Program panelists included Philadelphia Court of Common Pleas President Judge Pamela P. Dembe; Judge John W. Herron, administrative judge of the court’s Trial Division; and President Judge Marsha H. Neifield of the Philadelphia Municipal Court. Gina's blog is an overview of what the panel discussed – specifically highlighting how social media has affected litigation in the courts. To read the full post, go to The Legal Intelligencer Blog. Wishing you a wealth of warmth and prosperity. It’s that time of year again, when we begin to think about holiday celebrations at the office. We’ve all been there, right? You drive into work and hear the holiday music on the radio and see the festive light decorations on the way home and start wondering about gifts for co-workers and the boss. I come from a large corporate culture where buying gifts for an entire unit or office section could leave you broke; it was usually the Secret Santa path I often had to travel this time of year. I liked that there was a monetary value limit to the gift exchange and we typically went in as a group, each person contributing a set amount to purchase a nice gift for our manager. This was a somewhat generic solution to a sticky situation, but, easy overall. As this is my first holiday season here at Furia Rubel, the idea of the season’s celebration in the office had been on my mind for a few weeks. I asked one of my co-workers what the gift-giving culture is at our office. She explained that up until a couple years ago, they used to give gifts to one another, but a few folks felt the obligatory giving was too stressful. It was decided there would no longer be gift-giving at the holidays and the staff have opted for a scaled-down celebration. We’ll have a pot-luck lunch (with emails going around indicating some great food to come) and ‘no obligation’ on gifts, but homemade food gifts are always welcome. That’s nice considering Furia Rubel has some top notch cooks and bakers. As an aside, the staff at Furia Rubel will be fortunate enough to receive some additional time off over the holidays as an extra gift. The office will be closed from Christmas Eve through New Years. An extra week of vacation at this time of year is a present we’re all grateful to have. However, your gift-giving may not be so easy. This is the time of year when we want to thank folks who have been helpful in our day-to-day jobs, supportive of our careers and those who have mentored us, so it’s worth taking time to plan what to do. Unless you want to be perceived as the office brownnoser, gifting-up is one of those actions you need to proceed with caution. An article in Ladies Home Journal points the way toward a manager’s hobbies or donating to a charity in their name as being rather safe for gift-giving. If you don’t do a Secret Santa or even if you do, but want to give to someone who has done something special over the past year, the inter-cubicle gifts should be given as discreetly as possible, so as not to ruffle other co-workers’ feathers. 1. Decide on a spending cap and stick to it. Setting a limit and sticking to it eliminates others thinking you are playing favorites, especially if you happen to pick out the name of someone you socialize with in and out of work. 2. If a co-worker is unable to participate, be considerate. Some people, either due to finances, religious or cultural differences, prefer not to partake in holiday giving and their wishes should be respected. 3. Avoid personal items such as jewelry, cologne or clothes. Some things are just too personal for the office friendships unless you truly know the person or are longtime colleagues. 4. Write your own gift ideas on the Secret Santa gift slip. Everyone who participates may write on the slip of paper they’ll put into the collective hat that’s passed around with co-workers names in it and may list up to three things they would appreciate that would stick within the allotted budget, i.e., candles, gift card to a book store or movie tickets, to name a few. 1. Don’t gift-up on your own. It’s important to recognize that the boss can see that you may be trying to ingratiate yourself to them. Some like it, but most do not and neither do your fellow employees. Decide on a dollar amount you will give for a collective gift. 2. Make a charitable donation in their name. What manager needs another tchotchke to collect dust on their desk or shelf at home? Making a gift in their name to a reputable charity or the charity of their choice makes a difference in someone’s life. 3. Tickets to a show or sporting event. Be sure to purchase at the very least, a pair of tickets. 4. If someone is unable to participate – Understand regardless of their reason and have them sign their name to the card out of courtesy, if they’d like. Holiday gifting to the boss doesn’t need to be stressful, and for those who don’t participate, it can be worrisome as to how givers and non-givers are perceived in management’s eyes. Remember, the season is about giving. If you get a gift from someone and didn’t get them one, a simple thank you is all they need. Reciprocating simply because you’ve been given a gift isn’t what the holiday season is about. 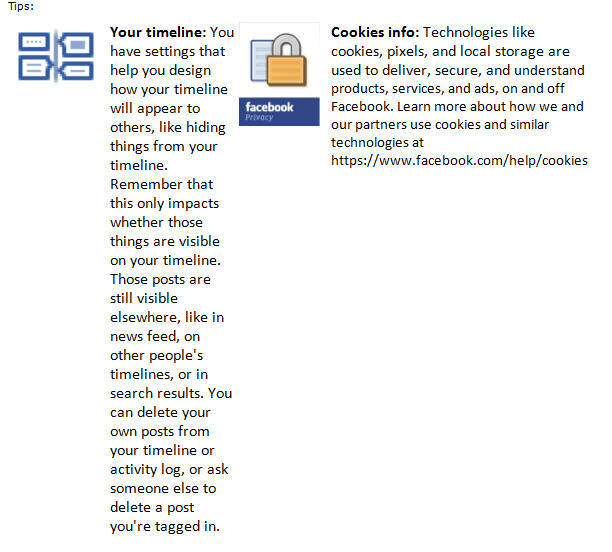 -Reminders about what's visible to other people on Facebook. We are also proposing changes to our site governance process for future updates to our Data Use Policy and SRR. We deeply value the feedback we receive from you during our comment period but have found that the voting mechanism created a system that incentivized quantity of comments over the quality of them. So, we are proposing to end the voting component in order to promote a more meaningful environment for feedback. We also plan to roll out new engagement channels, including a feature for submitting questions about privacy to our Chief Privacy Officer of Policy. We encourage you to review these proposed changes and give us feedback before we finalize them. Please visit the "Documents" tab of the Facebook Site Governance Page https://www.facebook.com/fbsitegovernance to learn more about these changes and to submit comments before 9:00 a.m. PST on November 28, 2012. You can also follow and like the Site Governance Page for updates on this process and on any future changes to our Data Use Policy or SRR. It is important to share your thoughts and concerns with Facebook in the event that they actually take user feedback into account. We’ll see. Gina Rubel recently authored a blog for Avvo.com's Lawyernomics blog titled, "Law Firm Crisis Planning and Management: Lessons Learned from #Sandy." The blog explores crisis management for businesses and how Furia Rubel and its law firm colleagues on the East Coast dealt with the aftermath of Hurricane Sandy. Gina discusses crisis planning and management issues such as life without electricity, transportation / travel, social media and crisis messaging. To read the full article, go to Avvo.com's Lawyernomics Blog. For most, long gone are the days of rolling out of bed on Thanksgiving morning, driving over to grandma's and learning how to create in sheer magnificence the traditional Thanksgiving meal with just a ratty old cookbook and grandma’s amazing culinary talents – passed down from generation to generation of slaving over Thanksgiving meals. This all hit me when I stumbled across some very interesting and real-time articles on how people can craft their holiday meals via YouTube and tech gadgets galore. One of the articles which knocked my old school Thanksgiving meal socks off was Mashable’s “How to Cook a Complete Thanksgiving Meal Using YouTube.” This article displays 12 YouTube videos on Thanksgiving meal how-tos from roasting the perfect turkey, cooking all the critical sides like mashed potatoes and stuffing to creating the dessert course of pumpkin pie AND incorporating the proper table setting and musical ambiance to enhance your dining experience. - A vegetarian cooking app for your vegetarian guests. - An iGrill thermometer which enables you to connect your mobile device through Bluetooth and monitor your bird’s temperature without ever opening the oven door. - A Belkin Chef Stand which is a non-slip base that keeps your tablet from moving around - all while the stylus maintains a clean screen as you navigate your way through various recipes. - A MyFitnessPal Calorie Counter and Diet Tracker which is a smartphone app that can be downloaded for free and helps you get back on track with your calorie counting after a hearty Thanksgiving meal. Perhaps it’s time for me to teach grandma a thing or two about combining traditions and technology to create this year’s Thanksgiving meal. All I know is that all this talk about Thanksgiving meal prep is making me very hungry and excited for this year’s festivities. I think I will stick to the tried and true traditions of jamming as many family members into one kitchen to create a Thanksgiving masterpiece using the traditional methods; however, these tips may be an interesting way to mix things up in the years to come. A Web search for the name of a lawyer will frequently reveal that lawyer’s Avvo.com listing on the first page of results. On Avvo.com, default profiles are created for lawyers from public information. Unless these profiles are claimed by attorneys to verify their identities, they remain mostly without vital information that viewers can use to learn about a lawyer, their firm and their services. Avvo profiles also have ratings associated with them that are based on very little information. The only way to improve a rating is to complete a profile. Below are details for the sections that are needed to complete a lawyer's Avvo profile. If information can be copied from a current website bio and LinkedIn profile, we find that, on average, each individual's Avvo profile update will take about 60 to 90 minutes to complete. Practice Areas - Add all primary practice areas (choices are limited to an extent by Avvo) with the percent of business conducted in each and a brief description of specific and unique services. Including the brief description allows viewers to read about services in more detail through a pop-up bubble on the profile. Fees and Payment Types - Adding this information should be determined by personal / firm preference. Contact Information - Add company name, address, office phone, mobile, fax, email, website and up to four blog and social media links. Languages Spoken - Adding this information should be determined by personal / firm preference. About Me - Add a professional photo and biographic information. 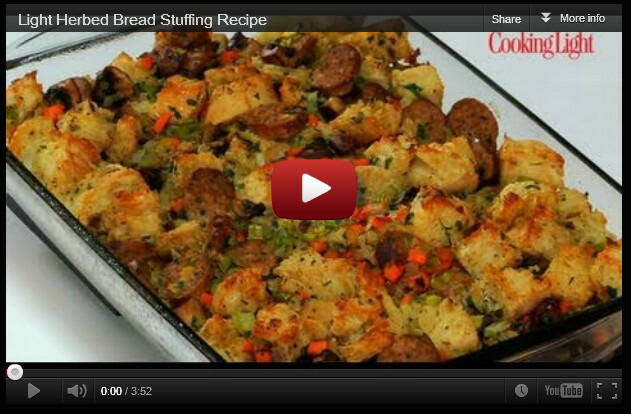 There is an additional option to link YouTube (or Vimeo) videos and have them displayed as well. There are two types of references on Avvo: client reviews and peer endorsements. There are automated forms that can be used via this section to request client reviews that should be used at the lawyer's discretion with approval from the firm. License - Add all states in which the attorney is licensed to practice. Note that you will need a Bar ID Number because Avvo verifies these records. Work Experience - Add all relevant past and present positions. Education - Add college, law school and advanced degrees. Awards - Add relevant awards and recognitions. Associations - Add organization name, dates and positions served. Contribution - Avvo has a system of earning points by interacting and communicating with the Avvo community to provide useful information. See the “About Contributions” section below for more information. Cases - Adding this information should be determined by personal / firm preference. This section requests case titles, details and outcomes. Publications - Add title, publication name, year and a link to online content, if any. Speaking Engagements - Add topic, event name, organizer information, date and a link to information online, if any. Avvo has a system of earning points by interacting and communicating with the Avvo community to provide useful information. Points can be earned in a variety of ways. What do contributor points mean? On the Legal Leaderboard page, contributors move up and down according to points. Our tests indicate that it isn't obvious to the public how to navigate to this leaderboard area, so the value of contributor points to the consumer is not clear. As with any social media, if engaging with the Avvo community, lawyers should follow the Rules of Professional Conduct for the states in which they are licensed to practice, should not reveal confidential information and should avoid debating the accuracy of another user's answers or comments. Avvo legal contributors should always conduct themselves professionally and never offer legal advice. Avvo has become an important player in organic search engine optimization for individual lawyer’s names across the county. Because of this, it is important for lawyers to complete their Avvo profiles at Avvo.com. Taking a short amount of time to complete a profile using the steps above will help support the online marketing of attorney’s names and their law firms. My sister-in-law Jackie works for a major insurance company and has been what they term a Work-At-Home (WAH) employee for more than a decade. It came about when her mother had a stroke and needed someone around just to keep an eye on her in case she fell or needed help with her medication. Today, 1 in 10 people work virtually, otherwise known as working from home. With the technology drive in this country, it’s only natural that corporations and small businesses alike, take advantage of employees working virtually. It’s a savings on work space, increases productivity, cuts down on absenteeism and according to one study, the WAH employee works an average of one hour a day more than someone who works in the office. For the employee, there are some great perks. Not having to commute to and from a job is the first advantage that comes to mind and I’ve always been jealous that my sister-in-law doesn’t have a dress code to follow and works in her pajamas for the first few hours of her work day. She also gets to start work and end her day earlier than most. She’s in her office at her computer at the ungodly hour of 5 a.m., but shuts that baby down at one in the afternoon. Sweet, huh? What is it really like to work at home, day in and day out? 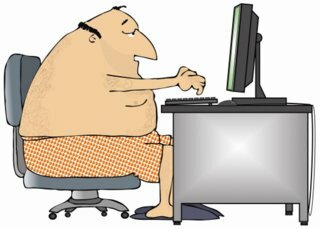 Although there are great benefits to working at home, there are some downsides to being able to sit at your computer and work in your bedroom slippers. One of the biggest obstacles that Jackie had difficulty with was the lack of social systems. Although she lived with an elderly parent those first few years, that didn’t fit the bill for the regular social skills that come with working in an office. I mean, how do you hang out at the water bowl with your cat and talk about the Monday night football game? Having others around is often essential for creativity and motivation. Without that, telecommuting can be both difficult and isolating. Communication is also a factor when you work virtually. Only using emails and instant messaging for discussing work-related issues with your colleagues, leaves out the cues one might interpret from body language and tone of voice that we pick up in a face-to-face conversation. Also, not being in the office tends to lead to that out of sight, out of mind truism and can cause a feeling of isolation. I admire my sister-in-law in her discipline over the years as she’s quite devoted to her routine, but for some people, maintaining a routine can be a challenge. We all have a routine when we are working outside the home: stopping for a cup of java from the local coffee shop, checking email and phone messages, chatting with co-workers about current events and office news, then, suddenly that’s all gone when you work from home. Getting into a routine at home to keep you in sync with the office is essential. One factor I’ve seen Jackie struggle with is that she’s home during business hours, which makes her easy prey for those pesky, yet necessary home maintenance and repair items, such as furnace cleaning, A/C maintenance, tree work, electrical and plumbing repairs. She is often at odds with her husband to get him to be present when people come to the house. Considerable interruptions and demands from children, visitors and others who impose upon someone working at home may cause getting work tasks completed to be a challenge. Of course, these aren’t the only things that can be tricky for those working virtually, but they are some of the most common pitfalls to be aware of if you’re thinking of bringing the office home with you. Oh, and that’s another one: difficulty separating work-life and home-life. That takes some discipline and practice to balance the two, but it can be done. Many of these difficulties can be overcome and this article by Lea Green on the PGI blog runs down a list of work-at-home snags and how to overcome them. Telework Research Network at Undress for Success.com is a group that studies the trend of working from home and has excellent resources for anyone considering working virtually or those that are already working from home. Every year, legal marketers across the U.S. debate the need and validity of the U.S. News & World Report Best Lawyers Survey. Some firms have decided to boycott it altogether, while others participate and use their inclusion for marketing, public relations and business development value. Last year, my colleague Gina Rubel asked her legal marketing colleagues on a national listserv if they knew of any law firms or in-house counsel that subscribe to Best Lawyers and use the subscription to guide decisions about hiring counsel. A marketing director in Virginia said that her firm has in fact received business from their listing in Best Lawyers after linking an attorney’s Best Lawyer profile to the firm’s website. She said that within 12 hours, the attorney had received a call from a prospect who had gone to the Best Lawyer site and saw the attorney’s profile. The attorney was hired with a substantial retainer on what turned out to be a multi-million dollar case. This marketer also said that she knows of lawyers in her own firm who have been contacted by other attorneys who search the deep link listings in Best Lawyers to find other Best Lawyers for referrals. Her firm has had several matters referred to it as a result. On the other hand, there are many legal marketers who do not see value in Best Lawyers and feel that it is an “arbitrary ranking / metric driving poor business decisions.” To read more about this reasoning, visit Larry Bodine’s LawMarketing Blog. It is understood that responding to any ranking survey is an investment of lawyer and staff time. The benefits certainly need to outweigh the time investment. That said, when an attorney or law firm is ranked, there is a credibility factor that goes along with it. But the ranking in and of itself, is not what is going to benefit the firm. It’s what the firm does with it. For example, issuing a press release, sharing the release on the firm’s website and via social media, updating attorney bios and adding the news to the firm’s newsletter – are all ways to capitalize on such an investment. This has been a recent topic of discussion with many of our law firm clients and partners – and to reiterate, the choice is ultimately up to each law firm to decide on the value of the opportunity and whether or not their firm plans to strategically capitalize on its investment with supporting promotional efforts. Media icon Newsweek has decided to cease printing and convert to an all-digital format. Its last edition will be on Dec. 31, 2012. Founded 80 years-ago, Newsweek was once one of the nation's top-selling news weekly publications. However, it has seen a significant drop in audience – 51 percent since 2007 – and a resulting decline in advertising revenue. Perhaps this shouldn’t come as a surprise though. The Internet, blogs, social media and mobile technology have fundamentally changed the way that we secure, consume, publish and interact with news, opinion and analysis. Personally, I hope that Newsweek remains an influential source of news and analysis. In today’s communication environment, we need the insight and professionalism that legacy media like Newsweek provide. For more, read the full Philadelphia Inquirer article. Following a recent PR Lawyer blog post about Google and YouTube from our very own Jonathan Morein, I stumbled across this interesting article, “YouTube's analytics additions could reveal user engagement better.” I felt that it was only fair to share some of the YouTube analytics insights with our PR Lawyer readers – as we are all trying to educate ourselves on the best kept secrets of social media measurement. First of all, do you even know that you can analyze the success of your YouTube videos? 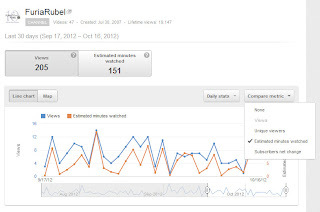 By simply logging in to your YouTube account and going to your account settings, you can access your YouTube analytics by finding “Analytics” in the horizontal toolbar of your screen. You can then choose the time frame for which you want to review analytics and can see Views and Engagement reports on your videos’ Demographics, Playback locations, Traffic sources, Audience retention and more. The ZDNet.com article by Rachel King that I previously mentioned details that there have been several upgrades added to YouTube’s analytics capabilities. They include a “Time Watched” metric, which identifies the estimated number of minutes a video is watched over a given amount of time as well as the ability to compare metrics. Users can now compare trends and patterns across different metrics. Producers of YouTube content can identify the value of a video by comparing time spent watching with estimated earnings. As part of YouTube’s Engagement reports, Annotations are among the most used features to drive audience engagement. Users are now able to utilize the beta version of Annotations reports to view data on the performance of their video annotations, with insights on viewer click and close rates. When engaging in the Views reports that YouTube provides, the user has the option to utilize a date slider. This new feature is available so that the user can easily adjust the date range of the data that they are reviewing and can see how videos perform across different time periods from seven- and 30-day totals to weekly and monthly totals. These rolling totals help to smooth the trends so that the user can see overall growth without some of the distracting spikes and dips. 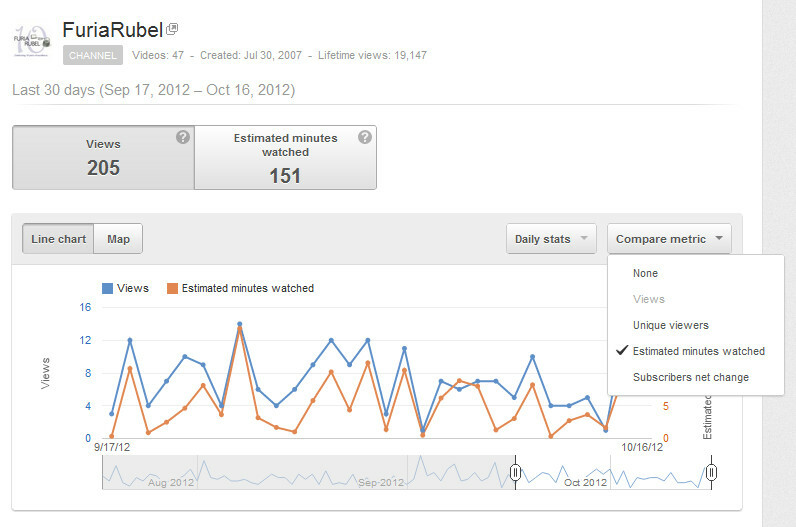 To view a full list of YouTube analytics improvements, visit the official YouTube Creators blog. YouTube analytics and its recent upgrades can certainly provide helpful resources to you or your company in relation to your next video content marketing campaign. Feel free to check them out and put these tools to good use when measuring the success of your next production or campaign. OK, I’ll admit it. I’ve got Google Alerts set up for my name. I also like to Google my name from time to time, just to see what comes up. Think I’m weird? An ego-surfer? Maybe, but there is a reason why I monitor my name on Google. You see, I’m not just interested in how I see myself – I want to know how you see me. Typically, when someone does a casual search, they will only read what appears on page one. Most won’t even bother to scroll down to the bottom, so it’s the first five or six links that matter the most. Therefore, owning that digital real estate, or at least a significant part of it, is important to your credibility. That’s not a big deal if you have a relatively uncommon name like mine. However, what if you have a more popular name, like Laura Powers? Just who is Laura Powers? The teenage girl who lives next door to Bart on the Simpsons? A custom jeweler from Atlanta? Vice president of marketing at Furia Rubel Communications? Obviously, she’s our VP of marketing. If you know anything about her, it’s not hard to distinguish her from the others. But, what happens if her name drops out of the top five? Her credibility could suffer or she could be missed altogether. so long as you update the content regularly, you’ve got a good chance of being seen. Make sure your bio and profile information are up-to-date so that you put your best foot forward when someone clicks through. Engage in social media: It’s rare to find a person who does not have at least one social media profile on Twitter, LinkedIn or Facebook. Make sure you post regularly and that your profile information is complete and presents you in a professional manner. Also, don’t ignore Google+. Connecting your social media profiles to Google+ will help them to appear closer to the top in a Google search. Google likes Google – go figure. Integrate keywords into your blog and social media: By using keywords specific to your profession, you will score higher when someone searches for your areas of expertise (e.g., marketing), it will help to differentiate you from someone else with the same name (e.g., Laura Powers the jeweler from Atlanta). Use a content manager: If lack of time is keeping you from engaging in social media, then consider using a content manager to organize your posts. A content manager is simply a computer program that allows publishing, editing and modifying of content on a website. A blog coupled with an RSS feed can serve as a content manager. Other programs like Hootsuite let you set up and distribute media messages at predetermined times. It’s all about using the technology to be more efficient. Photos: Don’t underestimate the value of a professional photo, especially in the online environment. Your social media profile photos will often appear in your Google search, so make sure they’re good ones. Ask yourself, could I show my profile photo to my mother? If not, upgrade it now and be sure to use your name in its title. IMG.001 doesn’t cut it. Video: YouTube has become the second most powerful search engine and Google indexes YouTube videos instantly. In fact, Google owns YouTube, so creating, personalizing and optimizing a YouTube channel will help you to rank higher in a search. Here are a few things to remember: Include your name in the title, check the visibility box, check the email location box and most importantly, choose three to five relevant keywords, separated by quote marks. Post on your company’s website: Having your profile connected to other high ranking websites will help to increase your search engine visibility. So, if it’s appropriate, post your bio and photo on your company’s website and blog on your company’s blog. Get quoted in articles, press releases or on popular blogs: Being mentioned in a relevant article will help your name to rank higher in a search. This can also apply to press releases, if they are optimized with appropriate keywords or appear on a popular website. Is your company’s website popular and well optimized? If there is an opportunity, ask your PR department to issue a press release that mentions your name. Submit for professional awards: Prestigious awards carry value for your name, especially if the organization posts the winners on their website or in a press release. Wikipedia: Few of us have the chops to have a Wikipedia page or appear in a Wikipedia article. That said Wikipedia articles appear in over 96% of Google subject matter searches, so being cited in a Wikipedia page will increase your visibility. There are other ways to increase your visibility on Google, but this should give you plenty to work on. If you’re fighting for that coveted Google space, then you’ll want to start using these tactics on a consistent basis. You never know who is watching.